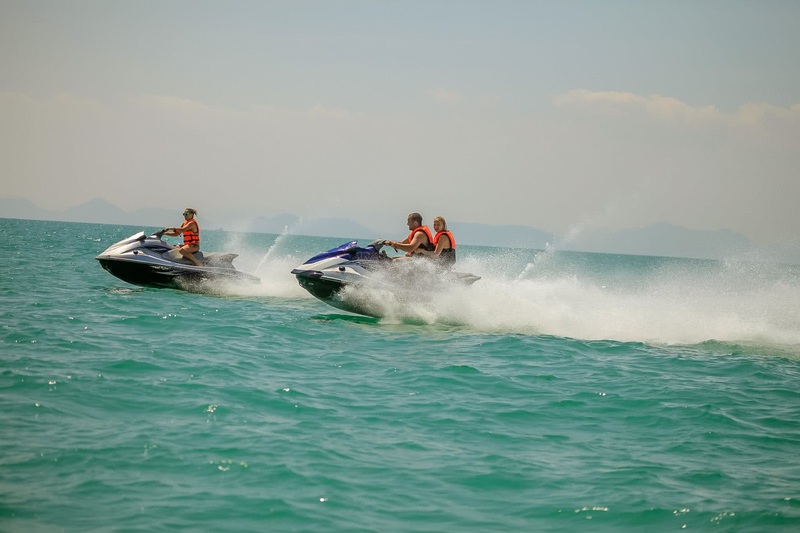 We would like to offer you the best jet ski tours that we have carefully selected for you which are offered by three Jet Ski centers on Koh Samui: JetSki centers in Maenam, Bophut, and Hua Thanon. All centers are certified and have all necessary licenses, insurances, and English-speaking guides. In most of the tours the routes can be changed due to weather conditions. 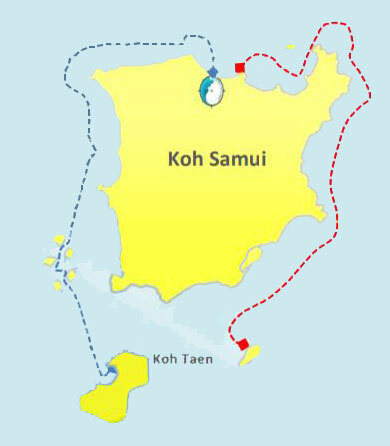 The main route is usually drawn in blue, and the alternate option is drawn in red. 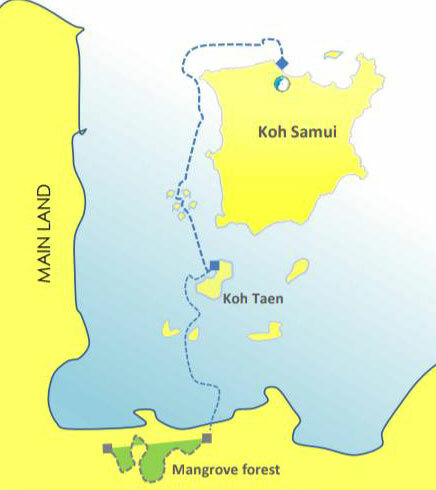 The most popular directions are to Koh Tan, Koh Madsum, Five Islands with the stops for snorkeling. 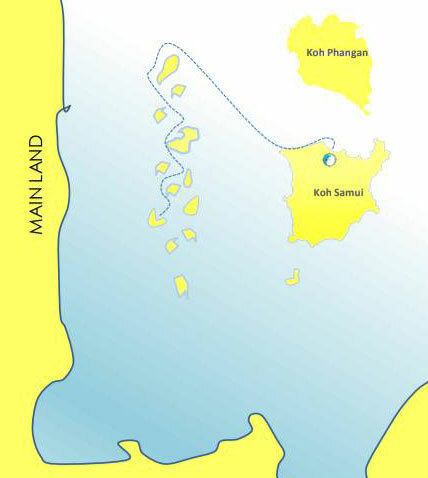 But you can find other variants including safaris to Koh Phangan. The selected tours should be checked the day before the tour. 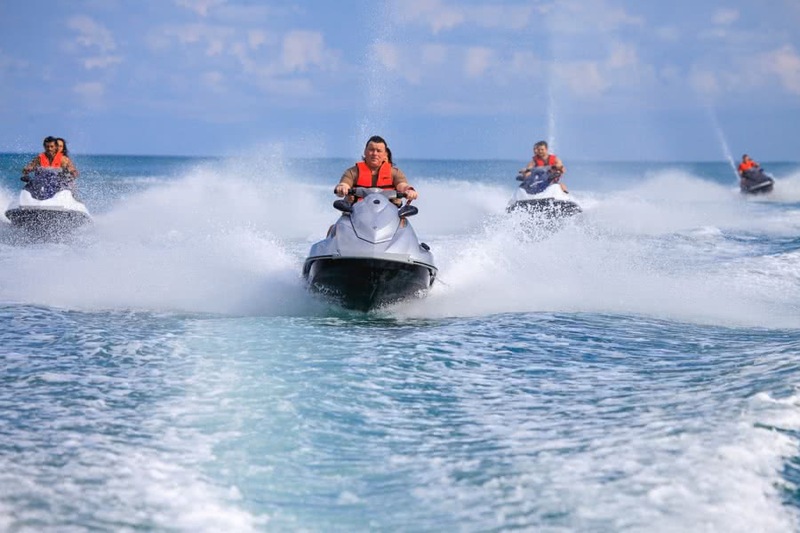 We can also offer you jet ski safari overnight tour to Koh Tan: Jet ski adventure to the island of Koh Tan with spending the night in tents. You can select the closest center. 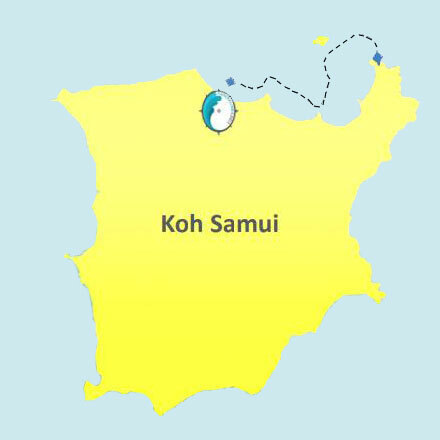 But transfers are organized from any place of Koh Samui. You should pay attention to the itineraries of tours. 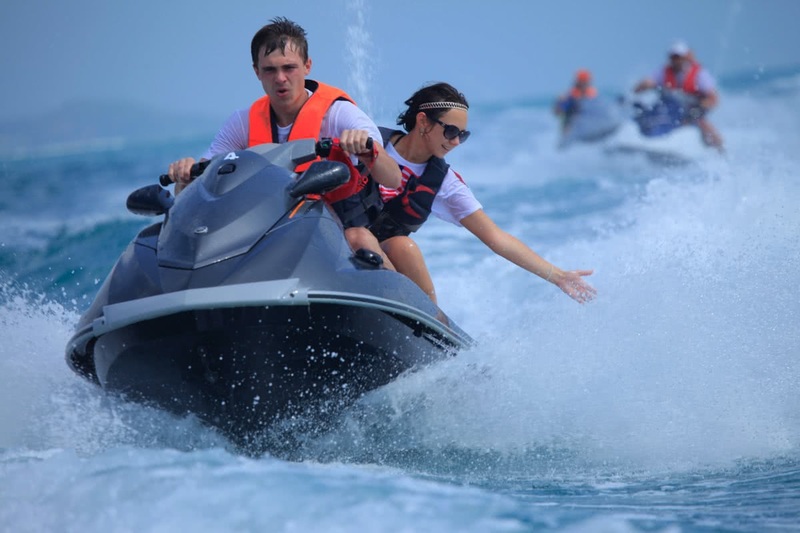 The price is per jet ski (for 1 or 2 persons). You can book group or private tours with a personal guide. 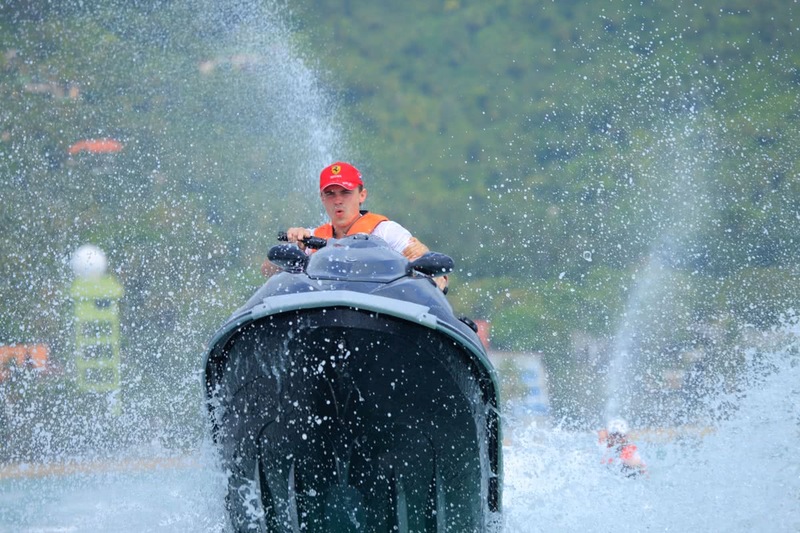 Please, mind the jetski driving experience. 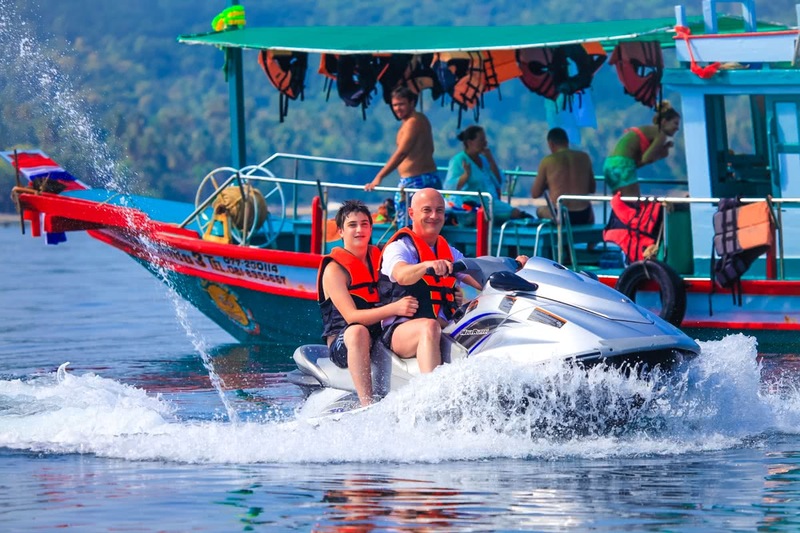 Jet ski safari is one of the most exciting and breathtaking tours to Koh Phangan or Five Islands. Please mind the following recommendations to make this tour pleasant and unforgettable. Put on close-fitting clothes. The most suitable clothes are a T-shirt with long sleeves and shorts below the knees of synthetic quick-drying fabric. You will feel water splashes even if the sea is calm. Wear a bandana or other tightly fixed headgear. Take only necessary things (money, cell phone) and put them in a waterproof bag. In JetSki there is a small compartment for things. It is better to take special glasses to protect your eyes from splashes of salt water. The glasses should be fixed with an elastic band. The common sunglasses will not be comfortable for such a voyage. Be careful with sunscreen on your face. The most creams can damage your eyes when the salt water washes it off. Do not drink much during the stops. It will be a long way to reach the nearest WC. Hydrodynamics is very different from what you are used to on land. 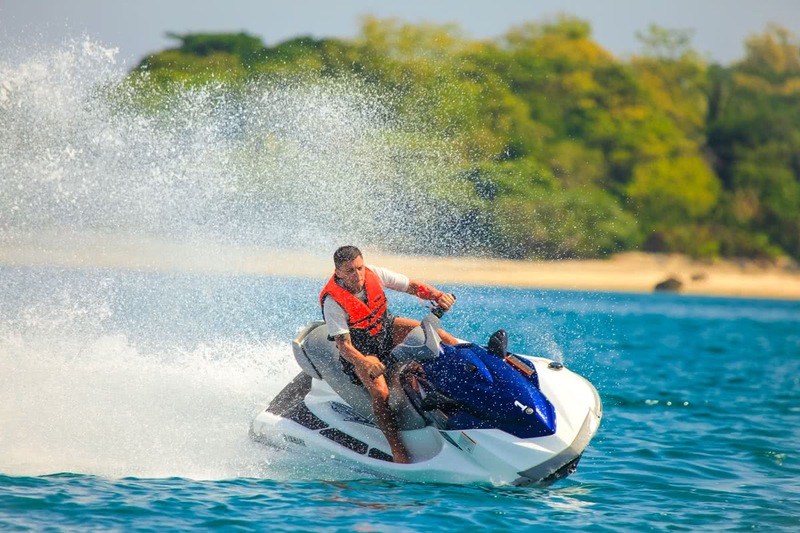 If you drive for the first time, take some time to get used to the jet ski and its possible maneuvers. 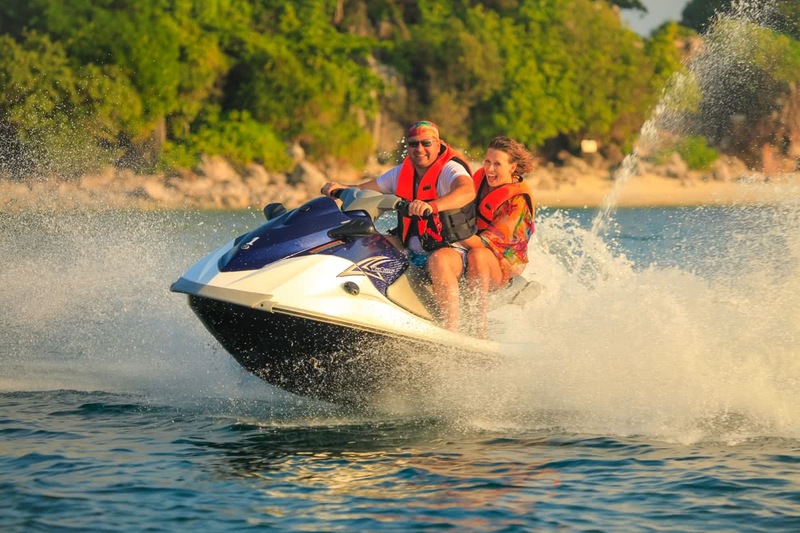 Observe the rules of driving a jet ski in a group. Stay at least 50 m away from your neighbors. When making maneuvers, make sure that no one is around. Be careful when crossing waves. With inaccurate maneuvers (especially turns), the jet ski can tip over. Even the seemingly calm sea will not be so calm. Gas smoothly at the coming of the wave and after it. 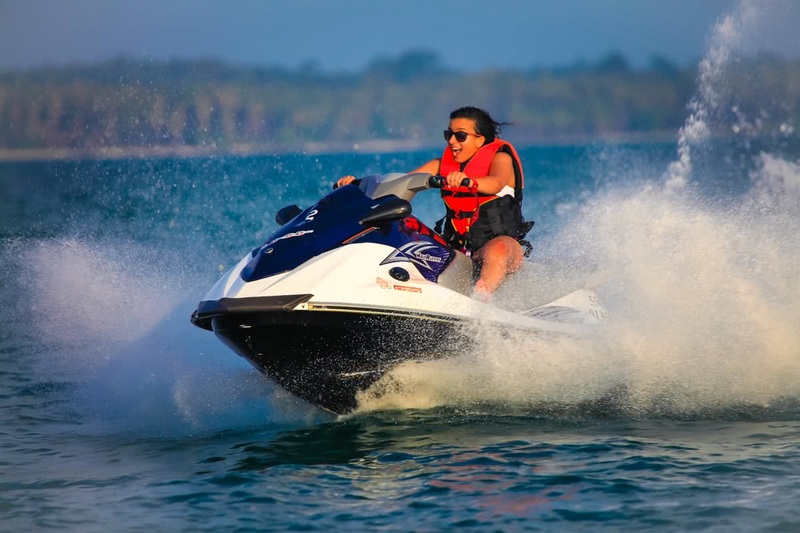 If the jet ski starts to “flop” from the wave and the warning lamp starts flashing on the display panel, slow down. 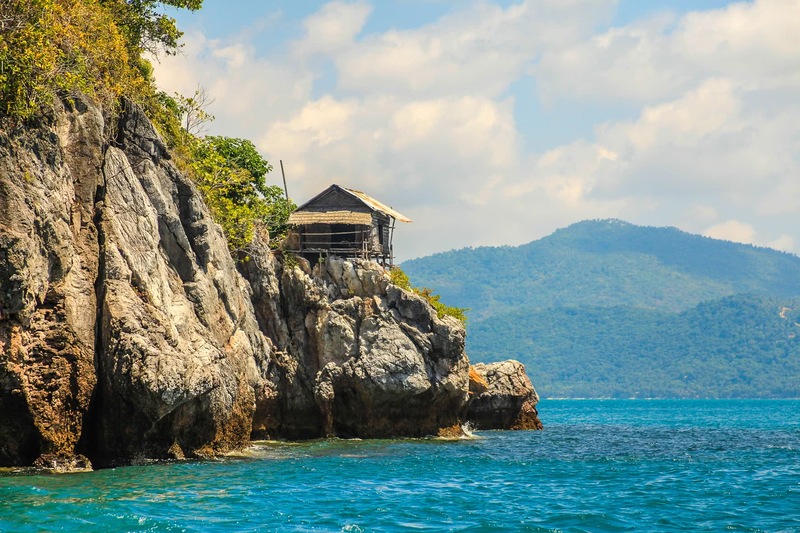 Access to some beaches is possible only along the definite way without corals, that is why follow the instructions of your guide. Gesture with two “parallel” hands means moving one after another in the column. The gesture “criss-cross” means to stop the engine. Do not separate from the route of the group, this is very dangerous since the terrain near the shore can be unpredictable. We recommend the following persons not to join this tour: those with poor physical fitness and slight ailment (such as head ache, recent operations). 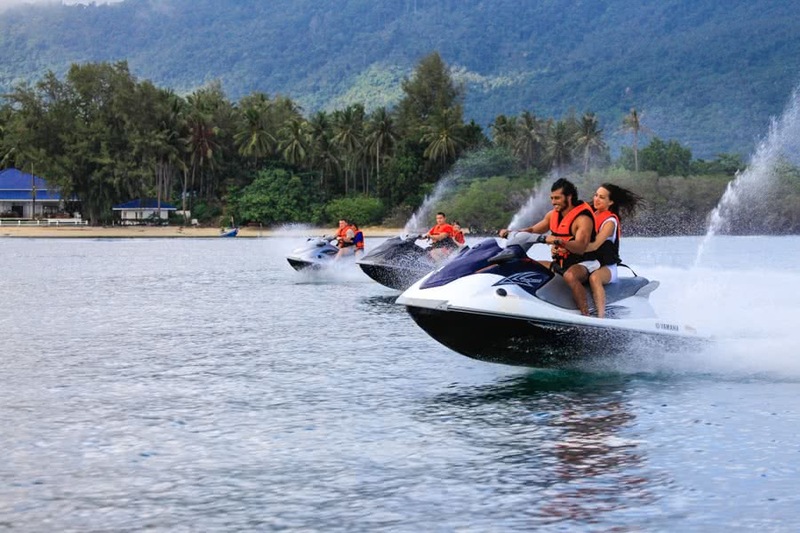 Price for jet ski (1 or 2 persons). The guide is included. 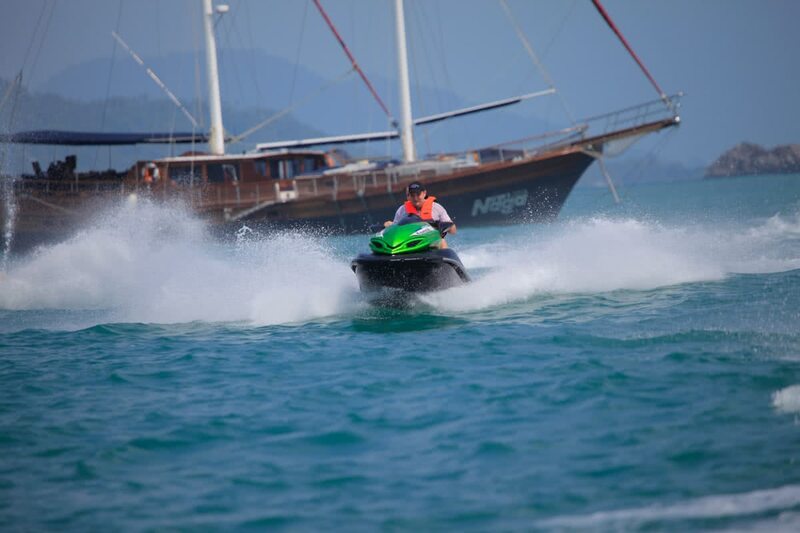 Reviews for "Jet ski safari from Koh Samui to neighbouring islands"
Jet skiing tour at Maenam Beach was fantastic! For anyone looking for a legitimate jet ski company, this is the one to go to. I absolutely love jet skiing and always look to do it whenever I can. With the scams that unfortunately do exist, I was delighted to be recommended this tour to everyone. Hope this helps anyone else looking for a great Jet Ski company!